This is a project I've been working on, off and on for the past week. I was going to wait and post about it later. But it seems someone had the exact same idea and beat me to the punch over on the Oculus reddit/Dev forums. As stated in the title, that was my goal. 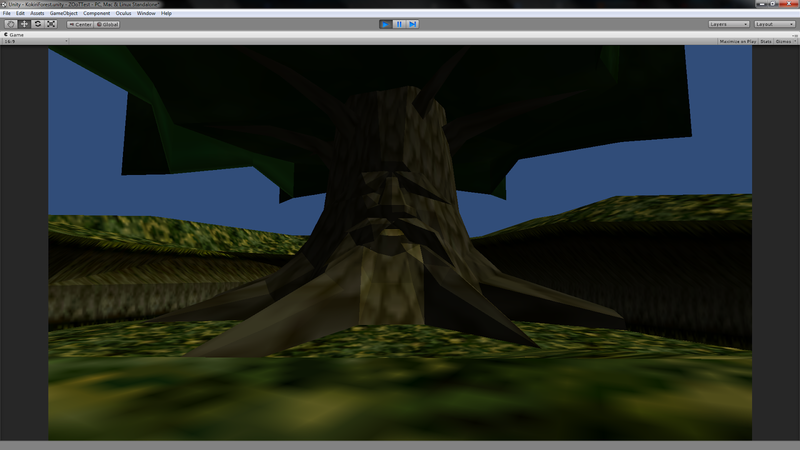 To make a Kokiri Forest experience demo for the Oculus Rift. It was to be my first Rift project. Here are some screenshots of my work so far. The wind has kind of been knocked out of my sails now. So I don't know if I'm going to continue. It's very demotivating. What I had left to do was. Color and add in the paths. Fix the wall tree texture colors. Add transparency to wall tree texture. Add a skybox of the proper brownish-yellow color. Add in the freckly lighting pattern that covers the grounds. Make the ladder to Links house and the vines climbable. Fix the graffiti on Links tree-house. Fix collisions for both sides of double sided meshes. Add in missing objects like rocks, signs, grass, soil. 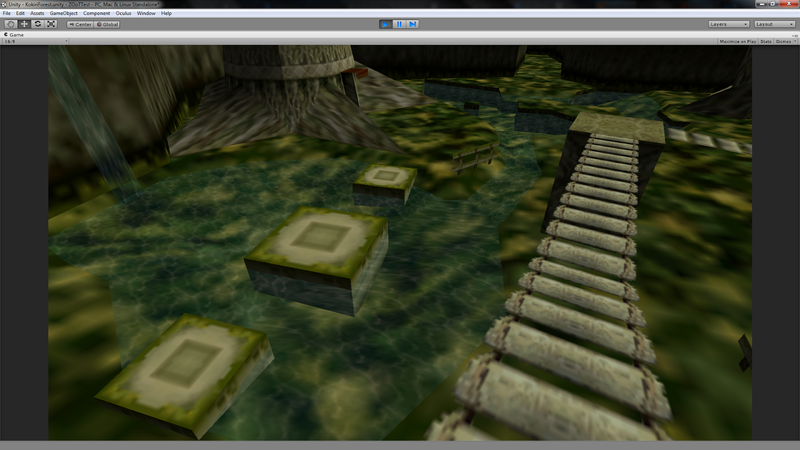 After that, I might have tried to add in some particles similar to what floats around in the N64 game. Then maybe links avatar itself. Maybe some characters/objects. Depended on how I felt after each step, and if something sounded interesting to learn with. Now though, it's probably time to go back to the drawing board. I need to figure out a new "first project". I won't say what, but I did have an idea for another N64 game. It's not much of a hint, but it's one I feel is very underrated. But due to that, it also probably wouldn't be something anyone cares about. Though I think VR would be a great fir for it and help give the game the attention it deserves. Of course at some point I plan to try making my own game. 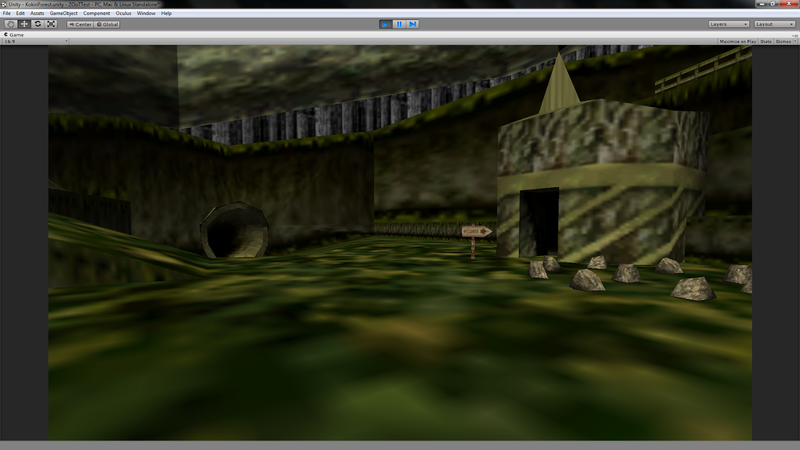 But I find working on a project like this much better for learning and getting myself used to Unity and Blender. Also I'm still early in my learning of Unity, and a complete project of my own from the ground up would be to much right now. My ideas would definitely exceed my abilities. My backup project proved to not be a good option, for a few reasons. And it seems the other Kokiri Forest project isn't going beyond whats already been shown. Except for a few differences, my project seems a bit further along. So I'll be continuing my work on it. I've been editing my task list as I thought of things to add. And since I decided to work on it again, today I got a few things done that I've marked with the "Strikethrough" text option. This is a project I was doing casually, with no rush or previous plans to announce it until I had most everything done. Since it's now out of the bag I'll likely post about my progress, and possibly release a build sooner then I planned. Just be warned, I use Unity Free, not Pro. So I can't enable the Rift warp shader. Instead, if you want to view this in the Rift once released, you would have to use OculusOverlay. That's a 3rd party program to basically add a Rift warp to anything. Its a extra hassle. How much of a hassle is up to personal opinion. But this was why I was going to hold off on announcing this for awhile, hoping to see Unity enable Rift warping in the Free version or a working workaround released first. Still, I'm not rushing this. It's a casual project. And one I was aiming for accuracy and detail with. Keep going with your demo! 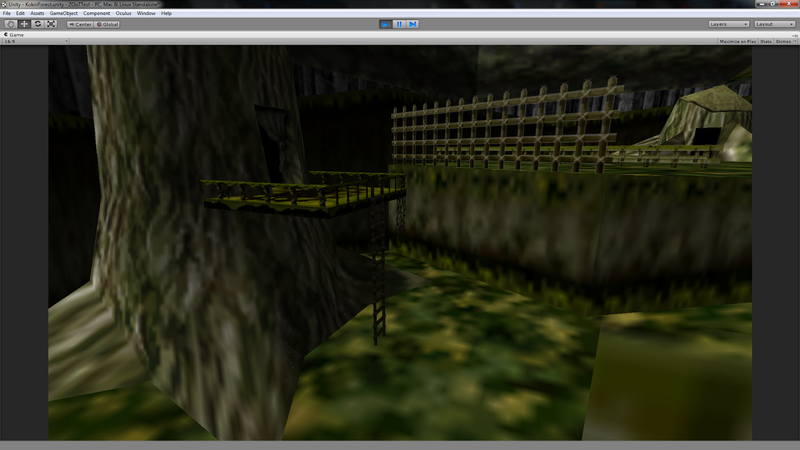 Between your demo and the one Rave posted I do like the look of your kokiri forest better. It is more accurate and detailed which the description says you are shooting for. It's slowly getting better too. I'm sure people are going to love it! What's really slowing things down is that more is needing to be done in Unity now. A lot of the Blender stuff was easy enough, just extremely tedious. The Unity stuff though is stuff like writing scripts for being able to climb the ladder/vines, scripts for animating the water, making it so you cant walk through fences, and managing the combining and overlap of some textures. 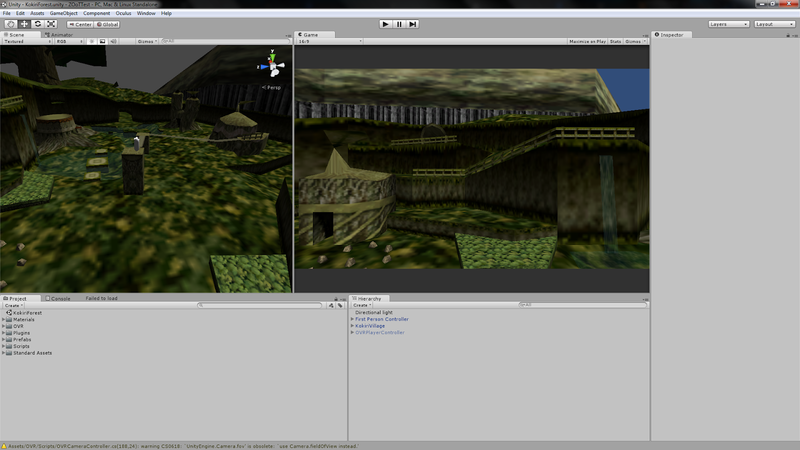 I'm still learning Unity so things can get confusing. I was impressed with rave's even though it was rough around the edges. If you could produce something functional then I would be inclined to explode with happiness.